Panasonic 2016 TVs: full OLED range, more 4K sets, better LED tech | What Hi-Fi? It looks like the Panasonic 4K OLED TV launched earlier this month will soon form part of a larger Panasonic CZ950 OLED TV range, according to Panasonic director, Masahiro Shinada. The 65in set revealed at IFA is likely to be joined by a 55in model, possibly followed by more OLED sets. While the cost of OLED panels remains high, and Shinada currently sees more potential in the business market for OLED, there are likely to be more Panasonic OLED TVs. Speaking to What Hi-Fi?, Shinada said: "For the consumer, we will expand the line-up. This year, it is only in 65 inches. We are now thinking of 55 inches. The line-up is very important to expand the OLED business. Panel cost is still very unclear, however." As well as OLED, Panasonic will be shifting the focus of its 2016 TV range further towards 4K, triggered in part by the success of the company's 40in 4K set (the five-star TX-40CX680B). Shinada said: "We have some ways to improve LED quality. We probably cannot fully reach OLED quality but we can improve LED quality by using our local dimming technology. We are now planning to launch the 2016 models next spring. Those models have new local dimming technology: we’ll aim for near-black picture quality. 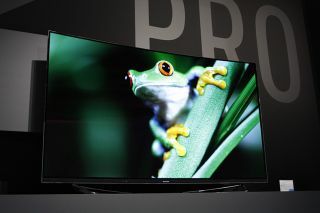 David Preece, marketing director at Panasonic, added: "The 4K market is growing very rapidly. We’re having great success with the top-end panels that have just come to market, but also from 40in upwards. 40in 4K has been doing very well for us, which in turn is making us consider the balance between 4K and HD. More towards 4K, really." You can read more about the company's plans for TV and also for Ultra HD Blu-ray, in our full Panasonic TV interview.